An exotic looking theme with a very attractive header! 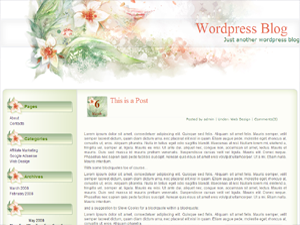 The header has the perfect color scheme of a white backdrop and green, red and pink flowers. It is a ready, fixed width two columned theme with all the basic requirements. The theme has a content area that displays the recently posted posts and comments comprises rounded edges at the corners and a sidebar with greenish pinch in it. The sidebar has rounded edges with flowers that complement the header’s design. It helps you to remain connected to the other categories and information of the website. This fantastic looking theme is created by the rayanmad.com and is just perfect for your website.